Which of the following about label modes on the Alcatel-Lucent 7750 SR is FALSE? RSVP uses downstream on demand label distribution mode. RSVP distributes a label mapping for a FEC when it has been requested to do so. LDP uses conservative label retention mode. LDP advertises label mappings to all peers for which it might be a next-hop for a given FEC. 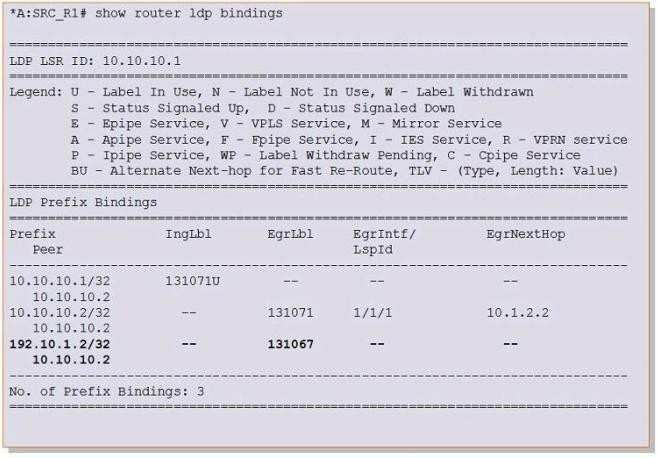 additional FECs will appear in this router's LIB? 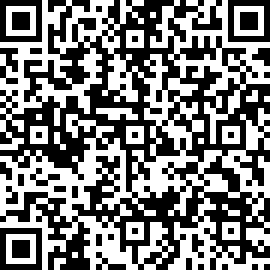 All FECs that are in the 192.168.1.0/24 address space. All FECs except the local FECs that are in the 192.168.1.0/24 address space. Local FECs that are in the 192.168.1.0/24 address space. All FECs that are not in the 192.168.1.0/24 address space. Which of the following about RSVP-TE is FALSE? It supports traffic protection using IGP equal cost paths. It supports LSPs that follow the IGP best path. It supports CAC to prevent resource overbooking. It supports LSPs with traffic engineering constraints. MPLS Echo Request packets are sent within the RSVP-TE tunnel that is signaled for "lsp- toR2". MPLS Echo Request packets are sent to the destination address of "lsp-toR2" over TCP. MPLS Echo Request packets are sent within the LDP tunnel that is signaled for Mlsp-toR2". 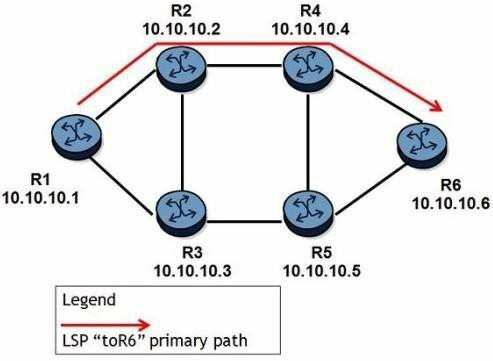 MPLS Echo Request packets are IP-routed to the destination address of "lsp-toR2". Which of the following about IS-IS Traffic Engineering on an Alcatel-Lucent 7750 SR is FALSE? Traffic engineering information is carried in the extended TLVs. Traffic engineering is required for constraint-based LSPs. Traffic engineering must be enabled on all IP/MPLS routers along the LSP path. Which LSA type is used for OSPF-TE? Which of the following regarding label population is TRUE? Selected labels from the FIB are populated to the LFIB. Selected labels from the RIB are populated to the FIB. Selected labels from the LIB are populated to the FIB. Which of the following is NOT an application of MPLS? Which of the following fields does NOT appear in the MPLS label header? What is the possible reason that the label for prefix 192.10.1.2/32 is not active? The router does not have a route to reach to the peer 10.10.10.2/32. The router receives an invalid label for the prefix 192.10.1.2/32 from its peer. The router does not have a route to reach to the prefix 192.10.1.2/32. 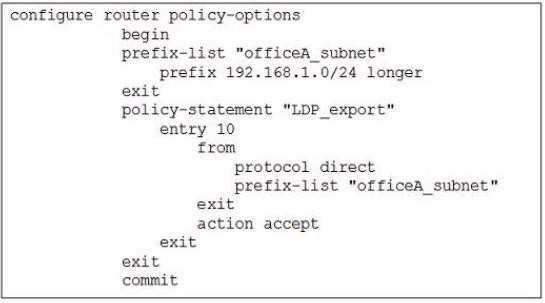 The router does not have an export policy defined to export the prefix 192.10.1.2/32 into LDP. Which of the following about RSVP-TE summary refresh messages is TRUE? They list the LSP I Ds that the router is refreshing. They list the Tunnel IDs that the router is refreshing. Assign an admin group to a MPLS interface. Configure an "include" or "exclude" statement on the LSP path. Configure CSPF on the LSP. Configure at least one strict hop on the LSP path. R4 (10.10.10.4) has established a link protection tunnel. R1 (10.10.10.1) has not established a node protection tunnel. R6 (10.10.10.6) has established a link protection tunnel. R2 (10.10.10.2) has established a node protection tunnel. Which of the following regarding the location of an MPLS label is FALSE? The MPLS label value may be carried in an ATM header. The MPLS label value may be carried in a Frame Relay header. The MPLS label value may be carried in a shim header. The MPLS label value may be carried in an OSPF header. An IS-IS TE enabled router has an interface on a 500Mbps link and it is configured with a 25% subscription. If this interface is not used by any LSPs. what value will be shown in the Reservable Bandwidth sub-TLV? configurations is required to enable fast reroute for this LSP? Enable fast-reroute on all routers along the path. R1, R2, R4, and R6. Enable link-protection only on router R4. Enable both link-protection and node-protection on router R1. 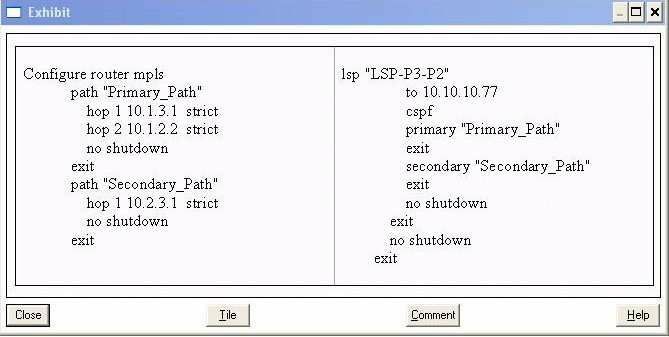 Enable fast-reroute with either one-to-one or facility mode on this LSP. to protect the LDP-over-RSVP tunnel? PE-1 requires T-LDP sessions to both ABR-1 and ABR-2. PE-1 requires fast reroute enabled on all RSVP-TE LSPs. PE-1 requires a full mesh of RSVP-TE LSPs to all routers in area 1. ABR-1 requires T-LDP sessions to all ABRs in area 0. Each implementation can use them as they see fit. They are used to carry QoS classification. They are used to carry the Ethertype value. They are used to carry the TTL value. Given the configuration below, which of the following scenarios is FALSE? Both the primary and secondary paths are explicitly defined. The LSP has the same source and destination for both primary and secondary paths. The primary path is active and the secondary path is in hot standby.